Trying to figure a best digital solution to managing Work order volume and scheduling. Mainly just trying to limit how many wok orders or labor hours are scheduled per day so the workload is manageable. Has anyone found a good way to do this in Lightspeed? Also looking at Booxi as a possible solution, it will start a WO in Lightspeed with some customer info but it will not integrate much more than that. Has anyone used this and was it helpful? I have been working on Lightspeed Integration for our bike shop online booking application, and was sad to find out that there is not currently the ability to create new workorders from the API. Customers, quotes, items and sales can all be edited via the API. Hopefully further support for work orders will be added in the future. In the meantime, I think you'll need to use a third party booking tool, like Booxi, to manage appointments. If you are running a bicycle repair shop, check out our product, https://velodrop.com. It is a bike shop specific booking and management software that can already limit appointment bookings by number of appointments daily, and/or by available employee labour hours. Lightspeed integrations are still in active development, but should begin rolling out in the next few months. I have been working on Lightspeed Integration for our bike shop online booking application, and was sad to find out that there is not currently the ability to create new workorders from the API. Customers, quotes, items and sales can all be edited via the API. Hopefully further support for work orders will be added in the future. In the meantime, I think you'll need to use a third party booking tool, like Booxi, to manage appointments. If you are running a bicycle repair shop, check out our product, https://velodrop.com. It is a bike shop specific booking and management software that can already limit appointment bookings by number of appointments daily, and/or by available employee labour hours. Lightspeed integrations are still in active development, but should begin rolling out in the next few months. Does the SMS portion have the ability to use our business number. Currently we are using ZipWhip and the integration for Lightspeed doesn't work. If I could pick up the scheduling app and sms for half the price I'm on board to switch to VeloDrop. Kind of late to the discussion, but if you're looking for a cheaper (and better) alternative to ZipWhip check us out at Ikeono (ikeono.com). We can text-enable your business phone number. 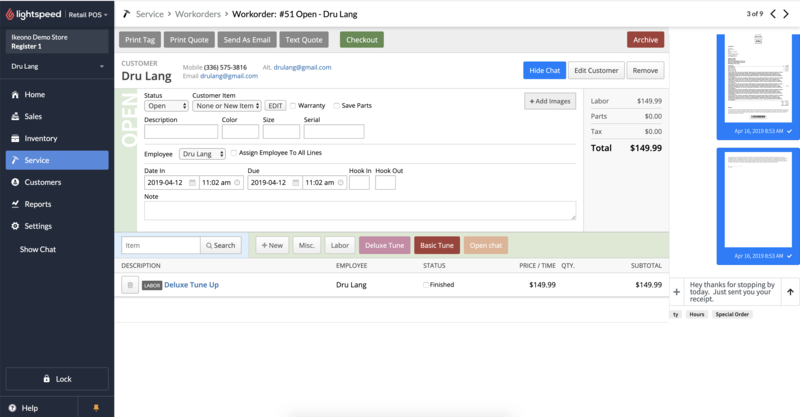 Our integration lets you text your customers directly in the Work Order view or Customer Profile view. Can also text quotes / sales receipts.